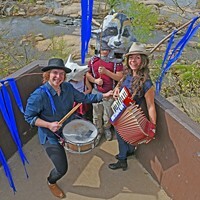 The Palace in Ginter Park | Cover Story | Style Weekly - Richmond, VA local news, arts, and events. Six generations called it home, but now the Worsham family is moving on. The Italianate house, at top in about 1914 surrounded by a privet hedge, has changed little since its completion 102 years ago. A bust of Ludwig van Beethoven now rests in the pediment of an attic dormer. There’s no ordinary move underway at the home of Gibson and Charlotte Worsham. This is a dramatic change that’s been more than a century in the making. Since their family finished the house in 1914, six generations have lived here on Brook Road in Ginter Park. It’s unlikely that any other household in Richmond can match such a continuous generational residency at one address. But this legacy is about to change. The Worshams are preparing to sell their 7,158-square-foot house (including full basement), downsize, and move to rural Fluvanna County. The result, for now, is organized chaos. For weeks they’ve pulled treasures and ephemera from the attic and other storage areas. They’ve also made some discoveries, including two trunks that have been locked for decades. 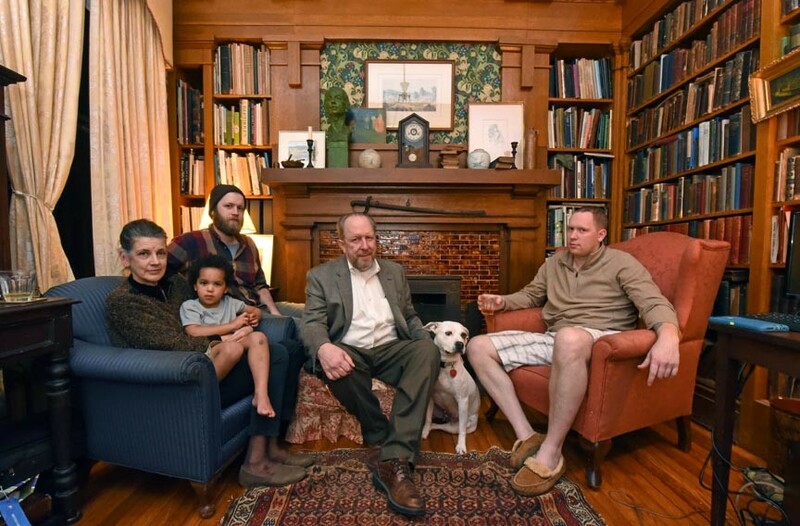 Members of three of the six generations of Worshams to live at 3601 Brook Road pose in the library with dog Madison. Charlotte holds grandson John Lee with husband Gibson and sons Braxton, left, and Charles. I’ve been visiting the Worsham house for 57 years of its 102-year existence. As a boy, I first approached the elegant Italianate mansion with its distinctive Venetian red stucco exterior after school one autumn day. It was my first piano lesson with Sarah Worsham Landrum. I recall crunching yellow maple leaves that covered the worn, boxwood-lined brick sidewalk. After ascending the two marble steps to the terrazzo-paved porch, I rang the doorbell and peered through the glass windows of the double front doors. Landrum glided toward the entry and swung open the door. “Come in,” she cooed. Sarah, as everyone addressed her, was an indomitable and handsome woman. She kept her slightly graying hair in a tight bun, and her smooth, pale complexion was her reward for a lifetime of minimum sun exposure. She was justly proud of her figure. When she didn’t wear makeup, it was because she’d been at ballet class — where she must have been five times older than her fellow students. Her instructor was Julia Mildred Harper, another Ginter Park grande dame. As neighborhood old-timers proudly reminded you, back in the 1940s she taught dance to Shirley MacLaine and her brother, Warren Beatty — whose first film in 15 years, “Rules Don’t Apply,” opens this month. They lived here while their father was a Richmond school principal. Just inside the Worsham house was a broad front hall that was dominated by a grand staircase. The hallway’s walls, like those of the living and dining rooms, were painted a wild shade of aqua. It was a hue harkening back to the over-the-top, but timeless good taste of designer Dorothy Draper’s 1940s interior treatment of the Greenbrier Hotel. In the perfectly proportioned living room, crisp, white cotton curtains hung from the windows and puddled on the wooden floors. In the summertime, the upholstered furniture was slipcovered in similar fabrics. Three pianos once jockeyed for space in the living room, including a grand that was lodged opposite a huge fireplace with an impressive mahogany mantle. Most sessions when my lesson was ending, Sarah’s husband, John “Cotton” Landrum, arrived home from his office and headed to the book-filled den to switch on the television. Bell Worsham, Sarah’s sister, who lived there too, would exit the den — her painting studio by day — as the light faded to dusk. 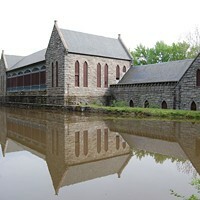 Bell had studied at the Pennsylvania Academy of Fine Arts in the late 1920s. She graduated in 1939 from Richmond Professional Institute, now part of Virginia Commonwealth University, and also studied art in Europe on a prestigious fellowship. One of the pleasures of the Worsham house is a fresco that graces a block wall of a basement corridor. Bell favored realism — her work was akin to the Ash Can painters — and was never tempted toward abstract expressionism. Her portraits, especially of family members, hung throughout the house. Many of them featured Sarah, often wearing one of her trademark hats. Bell never married. Alberta Reid, the cook and housekeeper, a native of Goochland County, whom the Worshams had employed since Bell and Sarah were little, usually was busy in the kitchen. In December 1959 at her piano students’ recital featuring works by Franz Joseph Haydn, Sarah Worsham Landrum portrayed the composer’s patroness, the Empress Maria Theresa, while Randall Slipek, 6, was dressed as Prince Egon Esterhazy. Along with Christmas and special parties, the Worsham manse never shined brighter than the occasion of piano recitals. While some of my siblings and friends took lessons from other Ginter Park instructors, such as Sarah Brown or Mamie O’Flaherty Stone, no one produced extravagant recitals like Sarah. For each program she had students learn compositions, simple or difficult, depending on their proficiency, by the same classical composer. It was usually on a major milestone, say an anniversary of Johan Sebastian Bach’s birth or Frédéric Chopin’s death. The Worsham house was transformed into a candlelit salon, a palace, and students donned appropriate period costume. For the Franz Joseph Haydn recital, I portrayed the maestro. My 6-year-old brother, Randall, who played the clarinet, was costumed in 18th-century finery as Haydn’s patron Prince Esterhazy. Throughout the recital he sat frozen at Sarah’s side. She wore a full-length gown and tiara to portray Haydn’s patroness, the Empress Maria Teresa. Sarah’s sister, Bell, was dressed in an explosively colorful outfit to represent the Austrian peasant class. Regardless of the composer, era or nationality, recital refreshments were the same — a punch mixed of orange juice and ginger ale, in equal amounts, and a large sheet cake from the nearby Belle Bakery with the composer’s name and life dates inscribed in contrasting frosting. Of all the recitals, the highlight was a staged performance of the opera “Lohengrin,” which was performed on the back lawn against a backdrop of thick bamboo. Better at theatrics than piano performance, I made the iconic swan boat — a contraption attached to a Radio Flyer wagon. It magically glided across the yard pulled by an inflatable swan, which included me crawling along under a sheet. Piano student Sarah Wendt played the role of Elsa while a be-helmeted Harrison Marks, neighbor and football ace at John Marshall High, had the title role. The June afternoon of the performance was hot and hardly Wagnerian, but the student-performed music had been pre-taped — thoroughly modern for early ’60s. Over the years, I’ve often wondered about the fate of that swan boat, but no more. Charlotte and Gibson Worsham, Bell and Sarah’s nephew, have lived in the house since the late 1990s. And they recently found the prop in the attic as they were preparing to put the house up for sale. Lohengrin’s conveyance was discovered among hundreds of other items that had accumulated for more than a century — furniture, books, intriguing lamps, ornate baby carriages, scores of Bell Worsham’s paintings, and fascinating bric-a-brac. There also were two mysterious trunks that had never been opened during the time of anyone still living. I approach the house on a recent afternoon to visit the Worshams as they prepare for their move. Their 3-year-old grandson, John Lee Worsham, bounds around a corner when Gibson comes to the door. The interior has been changed a bit. The aqua is gone. The front hall and living room are painted taupe while a paint color explained to me as Schwarzschild blue covers the dining room walls. “We wanted to mix things up,” Gibson, an architect at Glave & Holmes, says. Hundreds of items from the attic occupy available surfaces. After we settle onto comfortable, facing sofas in a makeshift conversation area, Charlotte maneuvers tea and Gibson explains the lineage of his soon-to-be former family home. Newspaper publisher and entrepreneur George Gibson “Gib” Worsham and his wife, Julia Piltcher Worsham, bought the unfinished house and in 1913 engaged Richmond architect Charles M. Robinson to complete it. 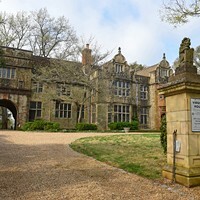 The house and the one-acre grounds at Brook Road and Walton Avenue was purchased by Gibson’s grandparents, George Gibson “Gib” Worsham and Julia Piltcher Worsham in 1913. It was nothing but an unfinished shell, having been abandoned since 1908 when its builder had financial trouble. To complete the project he’d begun earlier, the Worshams engaged prominent local architect Charles M. Robinson, famous for his designs of numerous Virginia schools and colleges. Gib Worsham had joined the staff of the Richmond Times newspaper, a precursor of the Richmond Times-Dispatch, owned by Joseph Bryan, in the late 1890s. He’d installed the first linotype, or typesetting, machines in Richmond. He soon left to start his own paper, The Richmond News. Among the entrepreneur’s real estate interests was building the Richmond Coliseum — not the sports and concert venue — but a building that housed a roller-skating rink and an exhibition hall. It’s now an apartment complex, on West Broad near Bowe Street. Around 1911, Gib sold his newspaper and opened the Richmond Press, a printing company that specialized in journals and other publications. He also liked Richmond antiquities. “Grandfather recycled everything,” says his grandson, Gibson, with considerable understatement. We’re not talking old newsprint. The elder Worsham salvaged four large iron gates that once surrounded the former Customs House, now the Lewis Powell Federal Courts Building, which had served as the Confederate treasury. A few blocks away, when the historic Exchange Hotel was demolished, Gib hauled home black and white marble flooring from its lobby. “Writers William Thackeray and Charles Dickens walked on those tiles when they stayed there,” Gibson says. 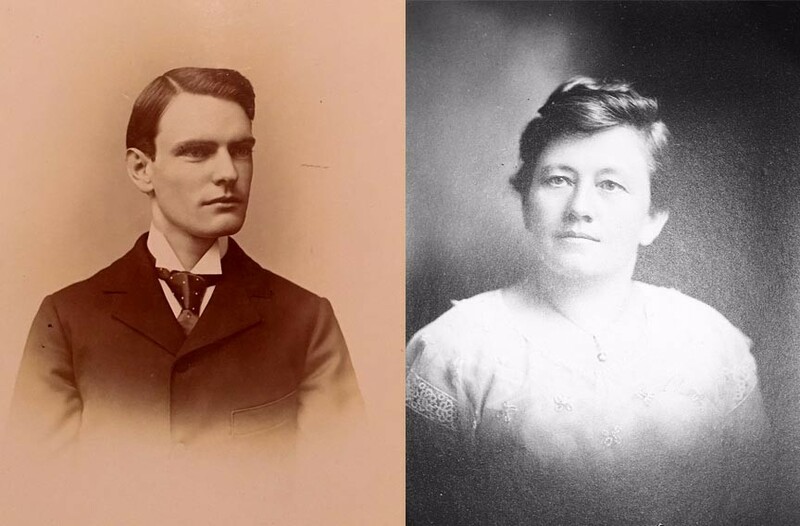 Gib’s wife, Julia Piltcher Worsham, who had graduated from Hollins College, was a clubwoman and a co-founder of the Ginter Park Baptist Church. 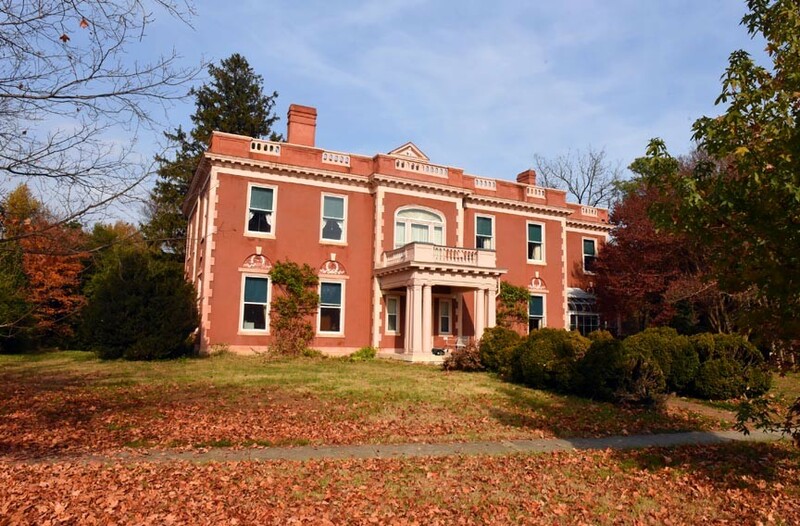 In 1914 when the Worshams moved into their new Ginter Park house, Gib’s widower father, John H. Worsham, moved in with them. After being wounded while serving in the Confederate army, he wrote a highly regarded memoir, “One of Jackson’s Foot Cavalry.” After settling in Scottsville, he worked as a grocer and bookkeeper and operated two boats that plied the James River and Kanawha Canal between Albemarle County and Richmond — the Albemarle and the Mary Bell. The third generation of Worshams to live at 3601 Brook Road were the children of Gib and Julia Worsham: Bell, Sarah and John, Gibson’s father. After marrying, John moved a few blocks away with his bride, the former Margaret “Peggy” Curry. 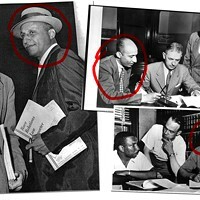 Sarah, upon graduation from Hollins College and after piano studies with noted Virginia composer and pianist John Powell (“He didn’t take just anyone as a student,” Gibson says), she married her long-time beau, “Cotton” Landrum. “He’d been a football star at the University of Richmond and was the real love of her life,” Gibson says. During World War II, the couple lived in Nebraska when he served in the Army. They later moved to the Worsham house where they lived out their lives under roof with her sister, artist Bell. Sarah Worsham Landrum posed in 1982 in the living room beside her portrait, “White Fox Bonnet,” which her seated sister, Bell Worsham, painted. Upon their deaths, Gibson’s parents, John and Margaret Worsham, moved into the Brook Road house. Gibson and his brother, Curry, had graduated from college. Gibson Worsham and Charlotte Schneider met in Kentucky, where they were working with a historic preservation organization, and were married in 1981. 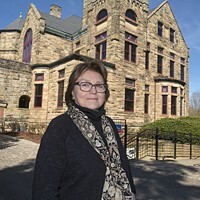 After working in Boston for a number of years, Gibson and Charlotte settled in Yellow Sulphur Springs, near Christiansburg, while Gibson worked on a master’s degree in architectural history at the University of Virginia and built an architecture practice. They reared their four sons in the Virginia mountains, home-schooling Richard, Charles, Braxton and Stephen. The family spent the time from Christmas to Easter with their grandparents, John and Peggy Worsham, in Ginter Park. Now grown, the interests and careers of that fifth generation of Worshams to live at the family place have taken them to far-flung places. Richard, the eldest, is married and lives in Goshen, Indiana, where he manufactures motorcycles inspired by classic 1920s designs through his company, Janus American Motorcycle. His brother, Braxton, works in Richmond for Relay Foods in customer relations. Stephen, who builds yachts, lives in New York. Charles, an Army veteran, lives part-time in Alaska. While he’s on assignment for an oil company as a security contractor on the Arctic north slope, his son, John Lee, lives with his grandparents, thus becoming the sixth generation of Worshams to live on Brook Road. With their family grown and spread out, Gibson and Charlotte are downsizing and tackling new adventures. That includes moving to Fluvanna County, where they’re restoring a 19th-century farmhouse. These include a secret door that his father included in his redesign of the den some years ago. He also recalls the boxwood maze, vegetable garden and chicken coop. 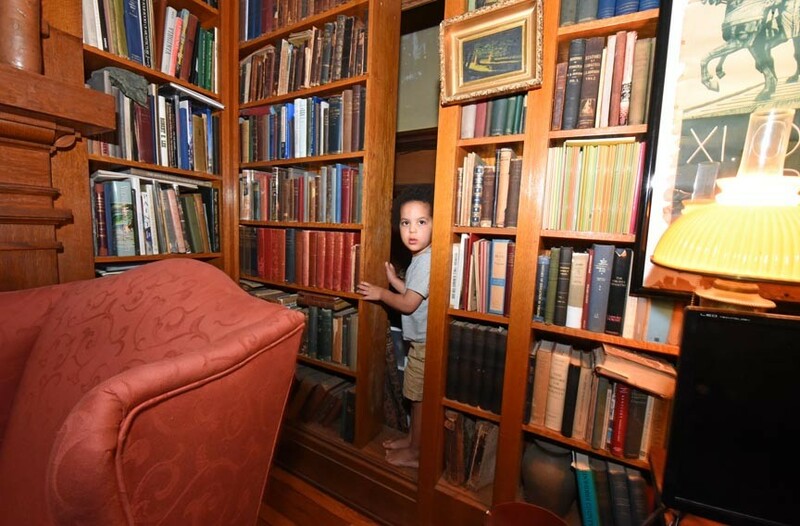 John Lee Worsham, 3, the sixth generation of his family to live in the 102-year-old house, demonstrates the sliding bookcase that provides a secret escape from the library. As for the two mysterious, locked trunks in the attic, Why had they never been unlocked? “I like having a little mystery,” Gibson says. But the move prompted their opening. Inside one of them, a stylish trunk embossed with the initials, S.W., for Sarah Worsham, was the Army uniform issued to Uncle “Cotton” Landrum during World War II. “Apparently, the trunk hadn’t been opened since Sarah and Cotton returned from Nebraska,” Gibson says. And what was in the other locked trunk? 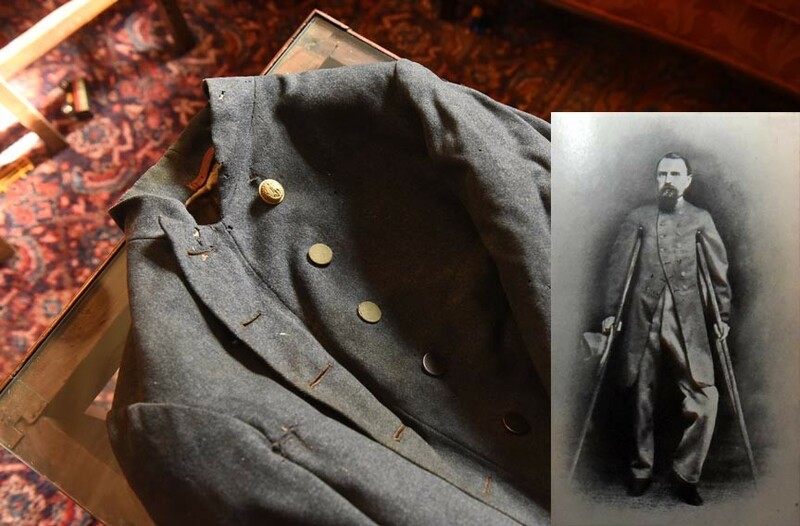 This Confederate army coat once belonged to John H. Worsham, which he wore in the photograph at right. It was among items found in a long locked trunk. He was the first of six generations to live at 3601 Brook Road. After a number of attempts to pry it open, they found the belongings that John H. Worsham had brought back with him from the Civil War — his jacket and military-issued trousers. The discoveries were especially poignant because the family has a photograph of him in that uniform. There was also a quilt “in wonderful shape,” Charlotte says. And finally, there were two bottles of liquor, one rum and one whiskey, partially filled and with the original label on the bottles from the R.L Christian & Co.